This happens to me all the time. I buy the ingredients for a recipe that calls for fresh herbs or my herb garden goes crazy. Fresh herbs are great and can really make a dish, so of course I will get them. However, after making the recipe I have at least half of the bunch left over or an over flowing garden. Grocery stores don’t sell a cup of Cilantro. They sell a bunch of Cilantro. I can put the rest back in the fridge, washed or perhaps in some water, or wet paper towels around the stems.. but I can guarantee you some or most will end up in the trash. How can I prevent this? Easy – PESTO. 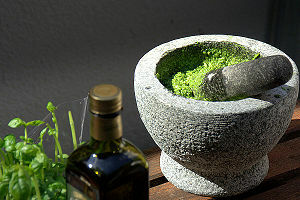 Or more simply – chopped herbs mixed with olive oil. The basic ratio of herbs to oil = 1 cup of fresh herbs to 1/4 cup of Extra Virgin Olive Oil or a1/2 stick of room temperature unsalted butter. I combine them in a mini chopper or food processor. If you don’t have one, mince the herbs by hand, add the olive oil and whisk to make like a slush like consistency. I then transfer to a zip lock freezer bag and freeze. Next time you require fresh herbs, you can then break off what you need for future dishes. It will save you a trip to the grocery store and allow for quick week night dinners. Side note: What is the difference between mincing and dicing/chopping? Size. minced is the smallest you can get it. The size increases from there to small, medium and large dice. It is also noted that each of the pieces should be about the same size to allow for even cooking. The exception to this is if a rough dice is requested. Rough just means non-uniform sized. Typically done when the items will be blended. In the pestos, if you are using a mini-chopper or blender, you can do a rough chop of the items before they go in, if they are large. If you are making by hand, aim to keep all of the pieces about the same size. If you want to get more fancy, below are some combinations I have tried with success. They are great to take from the freezer, place top on some fish or chicken while its cooking. The frozen chunk will melt and flavor the fish, chicken, etc.. while it cooks. Its is a quick and Instant sauce and flavoring. The applications are endless for a quick meal. If you need it thawed, like when tossing with pasta, place it in the microwave for 20 seconds. Remove it from the microwave and mash with fork and re-whisk to bring it back to life. Use Extra Virgin Olive Oil for all of the recipes below. Or substitute with unsalted butter. Don’t over blend. It should take less than a minute to puree the ingredients. Add more oil if it looks too thick. It should be a little oily. Most of the below can also be turned into a vinaigrette. For the amounts in the recipes, you would add 2 – 3 Tablespoons or Balsamic, sherry, Red Wine, White Wine, Rice Wine, Soy Sauce, Cider, or other vinegar and shake or whisk to combine. Adjust the amount of vinegar based on how much you are using. You may have to add additional oil – that oil can be sesame oil, or a hot chili oil. Start with a tablespoon of what you wish to add, whisk and taste. If you think it can take more, add more a little at a time. You may need to add a little of salt and pepper, start with a pinch at a time. This is your classic pesto. You can substitute the Basil with Parsley or Cilantro if that is what you have on hand. Combine all in a food processor and process until smooth. You can use a blender, or if you don’t have one, mince all by hand, then whisk in the olive oil. Taste and adjust seasoning if needed and add more oil if needed. You can use a combination of herbs such as Cilantro & Parsley, or Basil & Parsley, dill & parsley, Thyme, Oregano, parsley, or just a single herb. Combine all in a mini chopper or blender and blend until all the herbs and garlic are minced. Taste and adjust seasoning and add more oil if needed. This is great as a chimichurri sauce for seared flank/flat-iron steak such as those used in fajitas. Adding zest of Lemon, Lime or even orange zest will really help flavor the ingredients as well. Some sites recommend freezing in ice-cube trays, then storing. All up to you. Posted by culinaryease on August 26, 2011 in Cooking for two or less, General Cooking, Parties, Appetizers, and More, Recipes, Vegan/Vegetarian and tagged basil, Dijon, Dill, Herb, Herbs, oregano, Pesto, PostaWeek2011, thyme.